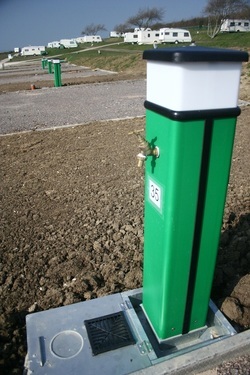 Electric hook-ups (EHU) have become an increasingly important part of the camping and caravanning scene. Whilst for many campers the whole point is to get away from everyday life - including electric gizmos and labour saving devices. Others like having some of their home comforts to hand even when they’re holidaying under canvas or parked up in their caravan. Few, if any, reputable camping parks allow generators on site, partly because of the noise, but also because of the danger of carbon monoxide and other fumes being discharged near tents, which could be deadly. Leisure batteries can deliver a limited amount of juice for lighting or other fairly low-power applications, but they’re heavy to lump around and once they’re flat you’ll need some sort of electrical supply to recharge them anyway. And they’re not going to last long, especially on appliances with higher power requirements. There are various means of drawing 12 volt direct current (dc) from car batteries whilst still on the vehicle, either off the battery terminals or through the lighter socket, or you can get power inverters which convert the 12 volt dc supply to 240 volt alternating current (ac) similar to domestic supply. But before you get too excited, inverters are OK for charging phones and the like, but for more power-hungry activities less so. It’s also difficult for an inverter in your car to power anything that’s in your tent, unless the car is left there all the time. Which can make getting out and about tricky! And don’t forget, the main function of your car battery is to start your engine. Draw too much power from it without the engine running and you’ll spend more time on the campsite than you intend, waiting for an AA patrol or some kind soul with jump leads! All of the above mean that EHU pitches have become increasingly popular for tents and caravan users alike. An EHU is simply a means of connecting your tent, caravan or campervan to mains electricity. But it’s not quite as simple as just plugging your device into the socket on the wall at home. First, you’ll need an electric hook-up cable. Owners of caravans and campervans are likely to have had one supplied with their vehicles and if not will need to check with the manufacturers to establish the right sort for them. Most consist of a “male” plug for the EHU socket at one end and a “female” socket that plugs into the van. Make sure that all electrical services inside the van are isolated before connecting and make sure that any spare cable is not left in a coil - just like a domestic extension lead, this can cause the cable to get hot. Once you’re all plugged in, turn on the supply. If at any point during this process the trip switch throws, first make sure that all services in the caravan have been turned off, but if it still throws, further expert investigation will be needed. It could be a fault with the cable, the wiring in the caravan or possibly with the EHU itself. Providing supply to a tent is broadly similar to that described above, although EHU cables for tents, instead of having a “male end” and a “female end”, have a male end to plug into the EHU socket at one end and, ideally, at the other a specialised camping consumer unit with its own Residual Current Devices (RCD) for you own safety. But cheaper cables are on the market that look like a set of normal 3-pin domestic style 13 amp sockets, similar to those you’d find on a “gang” extension lead. In the UK, most EHUs will deliver electricity at 240 volts (the same as domestic supply), but that’s only half the equation. For reasons of safety the current they deliver (the amps) are restricted, usually to 10 amps, but some offer 12 or 16 amp supplies. You need to know this figure, because if the current drawn from the EHU exceeds the maximum, you’re going to throw the trip and the electrical supply will be cut off. This may happen at your EHU, which is annoying for you, but you could also throw other trips further up the line which will be annoying for everyone else - and isn’t conducive to making friends with the other campers! To avoid blacking out your tent and those around you, you need to make sure that all your equipment - cables, plugs and anything you’re going to power -are safe and in good working order. 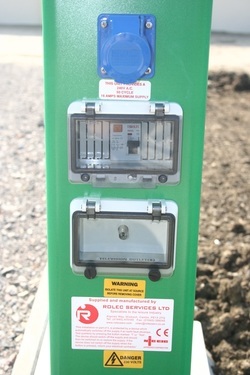 The camping park will have undertaken Portable Appliance Tests (PAT) on their own kit, including the EHU socket. So for your own safety and peace of mind, it’s something you might want to do on your own kit before you leave home. At very least you need to make sure that any appliance you intend to use is safe and in good working order. You’ll also need to know the power requirements for each of the electrical appliances you intend to use. This isn’t something most people do day-to-day at home, but when your living off an EHU it’s essential. The power an electrical appliance draws is a factor of the voltage of the supply and the current it uses. As the supply from the EHU is a known, 240 volts, and the power requirement of most appliances can be found on a label on the back or the base, it’s easy to workout how many amps the appliance will draw. For example a fairly standard 2.2 kilowatt electric kettle will draw about 9 amps of current (2200 Watts divided by 240 Volts = 9.2 amps). So if the EHU has a 10 amp supply, you’re already getting close to the edge with just one appliance. And that’s the thing, it’s not just the current each appliance uses, but the cumulative current. So you might get away with the kettle on its own, but stick anything else on and you’re going to hear that depressing click as the trip throws your world into darkness. This is why many experienced EHU campers either use other means to boil water for their “cuppa” - such as gas or spirit stoves - or they invest in specialist electric “camping kettles” which have a lower power requirement. Kettles are, for their size, particularly power and current hungry beasties. It takes a significant amount of energy to raise the temperature of a litre of water to boiling point and the only place an electric kettle gets that energy is through the electric wire. Heaters can be equally hungry. All of which is why it’s really useful to think carefully about what electrical devices you’re going to take camping before you leave and match it to the supply you’re EHU is going to provide. You don’t necessarily need to restrict yourself to only those things that your supply could support if they’re all switched on together. But you do need to think about which items you can run at the same time and which ones you just can’t. And don’t forget, some appliances have spikes in demand for electric current which may exceed what they draw the rest of the time. This may all seem like a bit of a hassle (although it’s a great job to set for the kids - so long as you check their maths!). But it is a small price to pay for those little electric luxuries (or necessities) if you feel you can’t camp without them. After all, the alternatives are no electricity or a flat battery. Compared to that an EHU is a real luxury! Especially in the middle of a camping field! And should you or yours feel aggrieved because the EHU supply isn’t enough to power every household and leisure electrical you’d like to have brought with you, don’t forget that your household supply can probably draw ten times or more current than the EHU. And whilst its not exactly the same thing, you wouldn’t expect your household supply to fire-up the Large Hadron Collider. So why would you expect a supply intended for a tent or caravan to power a fridge, a kettle, the TV and DVD player, an electric heater and Aunty Nellie’s iron lung! It’s all about working out what current is available and how much you need. Just in case you or you neighbours get it wrong, always make sure you have a torch close by. Most EHUs will deliver electricity at 240 volts (the same as domestic supply), but that’s only half the equation. For reasons of safety the current they deliver (the amps) are restricted, usually to 10 amps, but some offer 12 or 16 amp supplies....​"
3. Know what current your EHU delivers and make sure you match the combination of appliances in use to the available supply. 4. It’s a simple equation to work out how many amps an appliance will use. It’s the power in Watts divided by the voltage (240). Add the amps of all the appliances to be used at any one time and make sure that they are less than the permitted amps of the EHU. 5. In case you get it wrong, keep a torch handy!